Sometimes a public apology is just not enough! A few weeks ago, the Forward Times published a front page article entitled: HISD’S NEW SUPERINTENDENT SEARCH | Is the Focus on Getting Someone Better or Someone Not Black?, where allegations of whether the majority of the members of the Houston Independent School District (HISD) Board of Trustees were allowing race to be a determining factor as to who they wanted to be their next HISD superintendent were presented. The Forward Times called it like it was…and it was even more despicable than anyone could have ever imagined. This past Thursday, October 11, in one of the most low-down, unlawful and disrespectful acts in recent memory, the HISD Board surprisingly voted, 5 to 4, to remove Dr. Grenita Lathan as its interim superintendent and replace her with troubled former HISD superintendent Dr. Abelardo ‘Abe’ Saavedra. Saavedra served as HISD superintendent from 2004 to 2010 and left under a cloud of suspicion and with an exit package that cost taxpayers nearly $1 million (it was actually $978,967.00, according to the district). What made this action so troubling was that one of the items listed to be discussed on the October 11th HISD Board agenda was to: Consider employment of interim superintendent and employment contract through September 30, 2019. The consideration was for Dr. Lathan – at least that is what the HISD Board President Rhonda Skillern-Jones and a few of her other colleagues were prepared to decide on. There was never a discussion amongst the full board that they would be considering an employment contract for any other interim superintendent other than Dr. Lathan. An agenda item to remove Dr. Lathan as the interim superintendent was not on the Board Agenda that posted for the regular meeting. 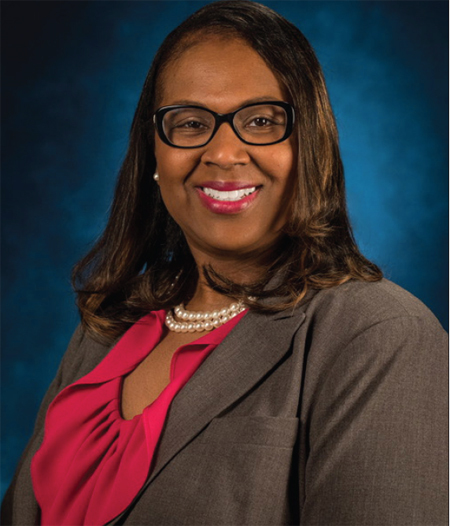 Dr. Lathan’s status of having her contract extended as the interim superintendent had not been decided upon, to that point, and a decision needed to be made to ensure stability at the top so the district could move forward as it continues to face academic and financial crises and a potential state takeover. The Forward Times recently reported that just a month prior, HISD Trustees voted, 6 to 3, to use the executive search firm, Hazard, Young, Attea & Associates, to help identify their next permanent superintendent, much to the disappointment of several trustees. In spite of the fact that trustees decided to move forward with a national search, while already having an interim superintendent in place who was doing a tremendous job getting the district in order, an unprecedented decision was made that had the markings of blatant racism all over it. Out of nowhere, as the HISD Board was preparing to vote on an extension of Dr. Lathan’s employment contract, trustee Diana Davila took out her cell phone and began to propose a motion to dismiss Dr. Lathan as HISD’s interim superintendent and replace her with Saavedra, effective the following Monday morning. That pre-drafted written motion was seconded by another in what appeared to be a planned and coordinated action. It is obvious that previous communication had taken place in order for this action to have occurred. Davila was joined by trustees Elizabeth Santos, Sergio Lira, Holly Maria Flynn Vilaseca and Anne Sung. The nerve. The audacity. The blatant disrespect. People in the audience began yelling and shouting their disapproval, as blindsided trustees tried to make sense of what was happening. Why would the majority of HISD trustees decide to replace an interim superintendent with another interim superintendent who had a checkered past with HISD, for only 6 months? More importantly, how could these trustees make a decision on hiring someone who had not been properly vetted and who had not even been presented to the full board as someone to be considered as the interim superintendent. This was a shocking development, as several members of the HISD Board expressed their disbelief from the dais as they were blindsided by the move. The action by the five board members was the most recent in a series of disrespectful attacks against Dr. Lathan, as well as the other African American members of the HISD Board and other staff members. Skillern-Jones was referring to Davila, who voted against a motion last month to extend Dr. Lathan’s contract for 12 months. Adams continued to state that there was racial division amongst the board between Black and Latino trustees and was adamant that the proposal that was unsuspectingly sprung on the board should have been discussed in closed session rather than on the dais. 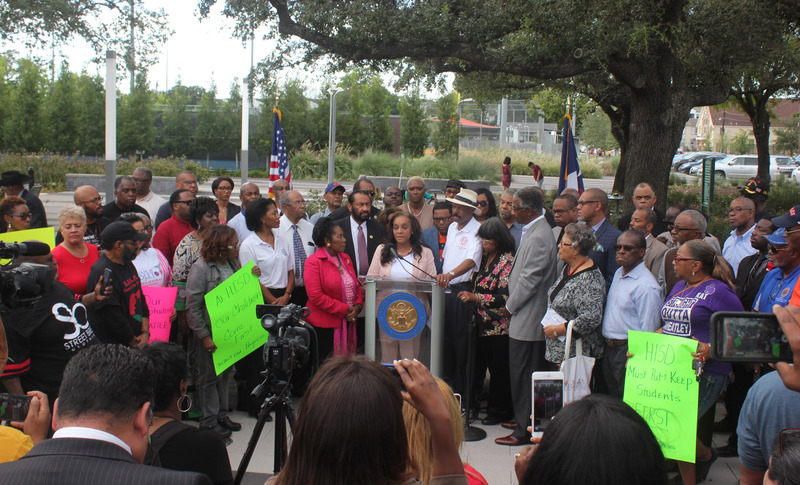 On Saturday, October 13th, a coalition of elected officials, civic, community, business and faith leaders, along with parents, educators and other residents, referred to as the “Protect Our Progress” Coalition, gathered to demand Dr. Lathan be reinstated and called on HISD to unify around the principles of stability and educational excellence for the sake of the children. After tremendous community pressure and backlash, the HISD Board met on Sunday and decided to reverse their decision to remove Dr. Lathan. 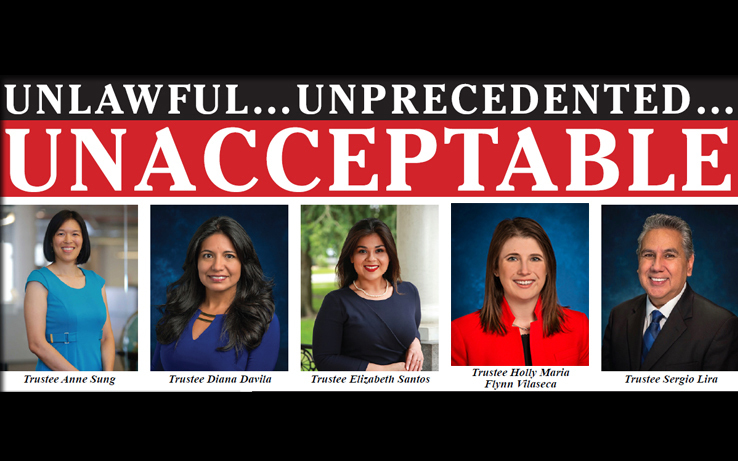 One of the most disturbing issues that has captured the attention of legal experts and members of the community is whether those five HISD trustees violated the spirit of the Texas Open Meetings Act, which was enacted to ensure that Texas government is transparent, open and accountable to all Texans. It requires that state and local governmental entities conduct public business responsibly and in accordance with the law. Currently, HISD is required to post public notices prior to each meeting. The purpose for requiring the posting of the agenda prior to the meeting is to give notice to interested individuals of the public who may want to comment on issues to be considered by a public agency. More importantly, did those five trustees break the law by putting together a walking quorum, as Saavedra has already gone on the record to state he had spoken separately to the five trustees who voted for him to replace Dr. Lathan, prior to the vote taking place. According to Carroll G. Robinson, Associate Professor, Barbara Jordan-Mickey Leland School of Public Affairs at Texas Southern University and former Houston City Council Member, from a legal standpoint this is a very big deal and the five trustees should be concerned. In order to help the public’s understanding of what happened regarding recent HISD superintendent decisions, the Forward Times has submitted a request under the Texas Public Information Act, to inspect or obtain copies of public records related to any communication concerning the HISD superintendent position, particularly any communications regarding the decision to relieve Dr. Grenita Lathan of her position as HISD superintendent and hire former HISD superintendent Abelardo Saavedra as the interim HISD superintendent effective Monday, October 15. The Forward Times will continue to follow the details concerning HISD and will keep its readers abreast of the outcome of its Public Information Request regarding these recent actions by the HISD Board that have caused a tremendous level of discord in the Greater Houston area.